2013 FF Open Futurity Reserve Freshman Sire Champion! PFF has the whole package - he is an own son of the legendary #4 barrel sire, DASH FOR PERKS and out of a proven 1D and ROM earning own daughter of the legendary #5 barrel sire, FIREWATER FLIT. His 2nd dam, Centennial Gay, has a huge record of her own; she has 105 AQHA Points between Barrel Racing, Tie Down Roping, Pole Beinding & Reining. WPRA/PRCA money earner, ROM & Superior Open Barrels and ended up 7th at the AQHA World in Tie Down roping. He is also paid up into all of the major breeders incentives! His foals get to run for a ton of extra bonus money for no extra entry fee. PFF is not only finished and proven in the barrel and rodeo pen but he also is an accomplished head horse for team roping! He won a bunch of money as a rope horse and his temperament in and out of the pen is to die for. He is quiet, respectful and calm. He really puts a great mind on his babies with tons of bone and great feet! We actually use him ourselves as one of our main ranch horses and at all of the neighborly brandings. 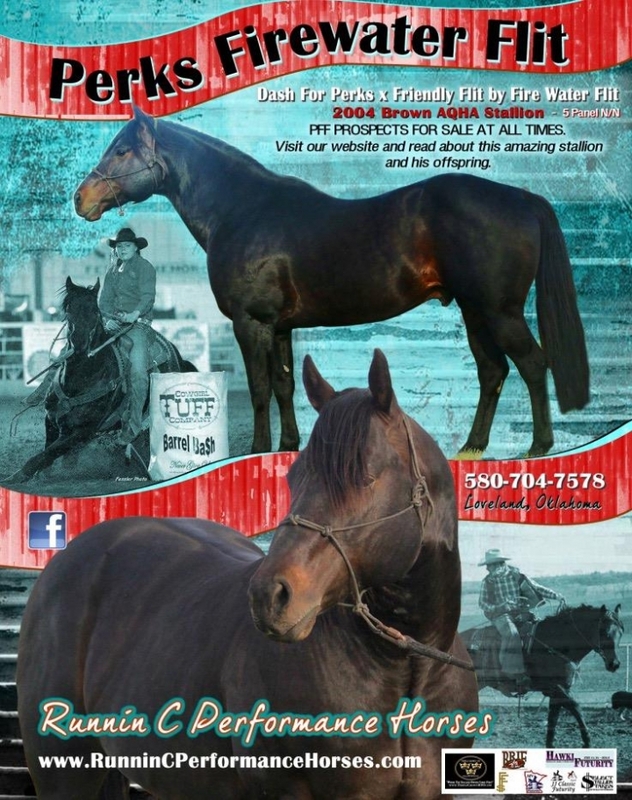 We welcome you to contact us to set up a time to come and meet him at Runnin C Performance Horses in Loveland, OK. His temperament and conformation will speak for itself and you will see why Perks Firewater Flit should be the sire to your next champion! 2017 Breeding Fee: $1250. On farm AI Only for 2017.